At Schartner Farms you'll find an outstanding selection of quality nursery plants, perennials and annuals, from "tried and true" varieties to exciting new introductions. 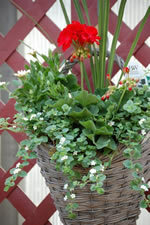 We also carry a large variety of hanging & decorative baskets. As a family-run farm, we take pride in providing you with the best plants available. Our experienced staff considers your needs and helps you select beautiful plants for your home, garden or landscape project.